Recently I got a flamingo flower (Anthurium). It was a gift from someone close to me and I'd say the perfect one. I've seen this type of flower many times but unfortunately know nothing about it. I've been trying to find out as much as I can about it in order to take good care of it. There are many information about it but i haven't been able to find the most important one. The flower is small, or the pot is small, to be more precise. To give you an idea, I put my Faber Castell eraser next to it to have something to compare to. The inside pot is 6 cm tall and it's full of roots, meaning the plant has no space to grow. 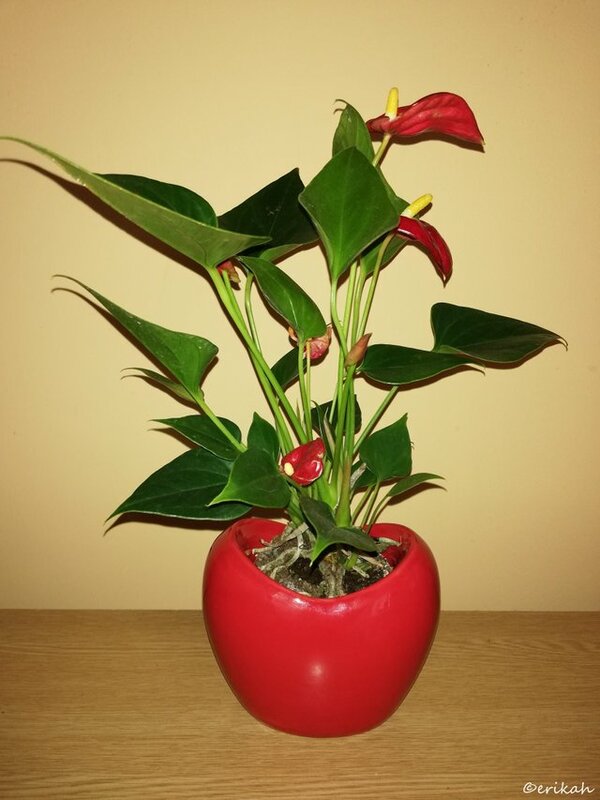 I know this hear shaped outer pot is just for decoration, part of the marketing, it looks great and can catch the buyer's eye faster but I don't know if it's healthy to keep this flower in this small pot for long. I'm asking for help here. If you know how to take care of this flower, please leave me a comment, any help is appreciated. I'd love to hear your experience, rather than read more about it on the internet. @ewkaw? Any advice? 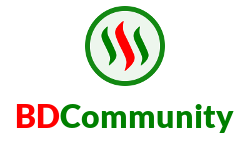 Hi @erikah, your post has been upvoted by @bdcommunity and the trail! I actually don't remember... It just died. Too much water, to little water... no clue. What I got to know is Anthryum humid tropical and satellite plant. Therefore, for their successful maintenance at the location of the room, requires increased temperature and humidity. 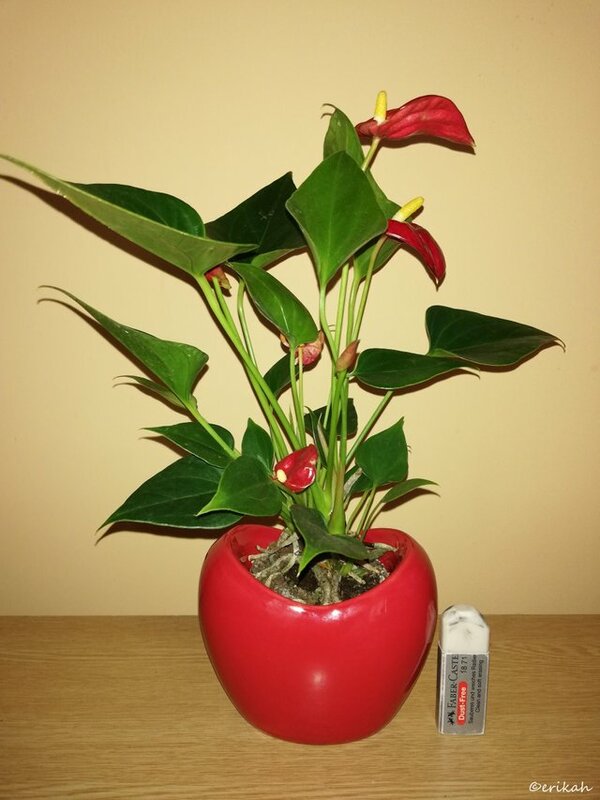 The optimum conditions for anthurium can be provided with a warm chamber 20-25°C. Hello @ayasha and thank you for the info. Looks like no one can help me with the most important info, regarding the size of the pot. Thanks for the rabbit, it's cute. It does look as though it has kind of outgrown it's pot. I suggest you move it into a bigger pot at some point. if you are scared of damaging the plant when removing it I suggest smashing the pot. I don't have green fingers and that is what I would do. It does, believe me. that size of pot is not good for any plant. I can take out the plant without damaging it, that's not a problem. Looks like I have to dig deeper to find the answer I'm looking for. I have never had one of those, so I can't help, but it certainly is lovely! Yes, I do that every week.